What our customers are saying about our Holiday Cottages In Landewednack To Rent. "Not as nicely decorated or interior designed as the other lighthouse cottages in the South West we have stayed in - and we have stayed in all of them frequently over the past 13 years! The living room is particularly grim and uninviting- so much so that we didn't sit in there. 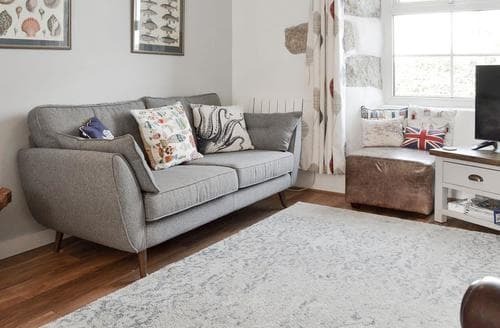 The sofa is a bright blue colour, there is a rug of another colour completely that looks as though it's been taken from another property altogether. Nothing matches in the room and it feels cold and not comfortable. There are no nice touches eg themed framed prints and lamps and the room really lets the cottage down. 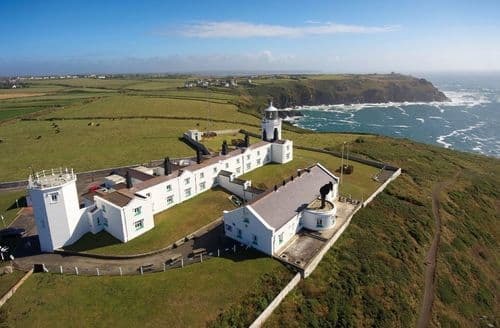 Likewise the upstairs bedrooms have a more utilitarian feel than all the other lighthouse cottages we stay in eg thin short curtains, magnolia walls. 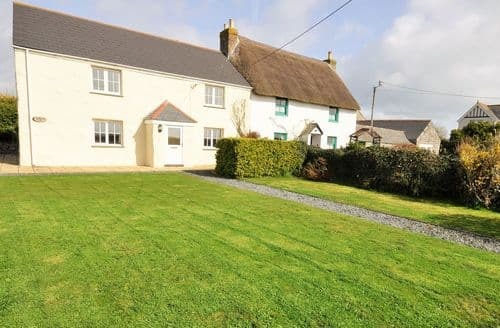 Basically there are nice elements to this cottage but overall it doesn't seem to have had any professional design interior design input, that make your usual cottages special places. They have a 4 star hotel feel and this is lacking in places at S69992. It may seem like a small point but its one of the main reasons we always book with Snaptrip." 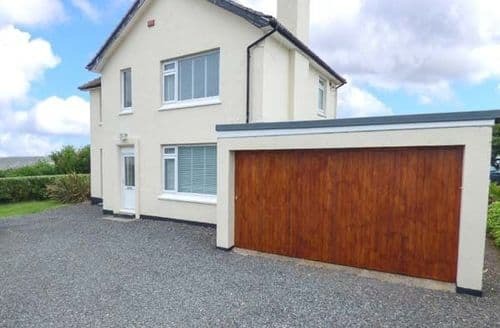 "The location is really special, with great views just a moment's step out of the front door. Great walks on the doorstep, nice pubs in town and had an excellent fish dinner at Coast restaurant there too. The interior is comfortable with nice furniture and decor, everything we needed for doing laundry and entertaining ourselves in the rain - board games etc. Was a bit worried about the fog horn but it wasn't as disturbing as we first thought, the brain tunes it out! A couple of points to mention are: that the fridge is a little small for 8ppl, while the freezer is enormous; while there was washing powder, there was only one dishwasher tablet (another thing to have to pop out to get! ); no info on recycling, we had to figure out how to do that ourselves as we didn't want to simply put recyclables in rubbish; and no wifi - we didn't want to use it much but became a problem as we had 2 'emergencies' when we needed to get online and signal is bad." "Whilst S69987 is somewhere we will probably always want to return to and it is in an amazing location, one has to bear in mind that it is located near to a very busy visitor centre and little effort is made to prevent visitors and the general public from wandering around the outside of the cottages especially during the evenings and on Fridays and Saturdays when the visitor centre is closed.Also and perhaps more importantly, first time visitors should be aware that the fog horn which is very loud and sends out a 3 second signal which is repeated aprox. every 30 seconds can and often does sound for long periods. Sometimes this can be for several days and nights continuously - even in the middle of summer ! During such periods when visibility may be reduced to just tens of yards, it can be quite difficult to appreciate the outstanding natural beauty of the area." 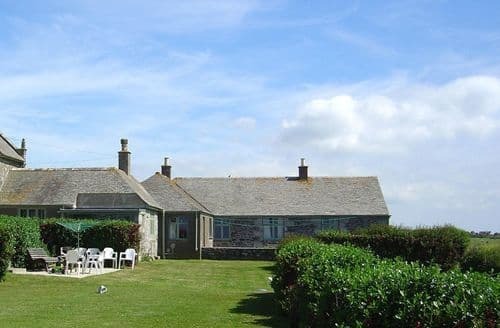 "Really lovely cottage and the West Tower was a real treat. We had a very atmospheric Christmas dinner with the wind booming around the tower and the floor vibrating below us. Makes you appreciate why lighthouses are there in the first place! The only disappointment during our stay was the kitchen, which was poorly equipped. There were only 4 teaspoons and it lacked utensils like kitchen scissors, roasting dishes and casseroles. We only threw our roasting pan into the boot as an emergency but would have been stumped without it on Christmas Day. There were no waste paper baskets in any of the rooms either which was a nuisance; sweet wrappers, tissues, make up remover pads etc all had to be stored up and carried to the kitchen. So it was the little things that irritated.However overall we had a memorable Christmas there and that was really what mattered." "S49587 is perfect! We couldn't have had a better experience. The house is gorgeous, clean, comfortable, well laid-out and has everything you could possibly need. The wifi and tv system worked perfectly for us. We particularly enjoyed getting cosy in front of the log-burning stove while we watched a storm rage outside - the big windows have stunning views of the sea and it's hard to tear yourself away. 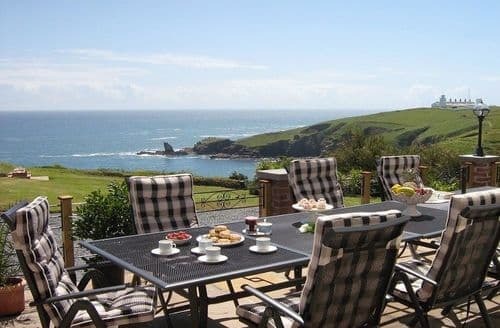 The grounds are great, we wrapped up and sat outside for an Ann's Pasties lunch on a few days, and having the Coastal Path right outside made for some amazing walks. Lesley, our host, could not have been kinder or more helpful, she made the whole experience so lovely for us and the welcome pack was brilliant. I'd recommend a stay here in a heartbeat ... except that we don't want the house to be too booked up for us to go back!"